Andrew is now the proud owner of a blue 2018 Ford Escape SE as a vehicle winner in the Select Sweepstakes, an annual campaign run by one of Canada’s leading providers of group car and home insurance — Economical Select. Along with their broker partners, Economical Select offers eligible group members an opportunity to win great prizes just for calling to get a quote on car or home insurance. 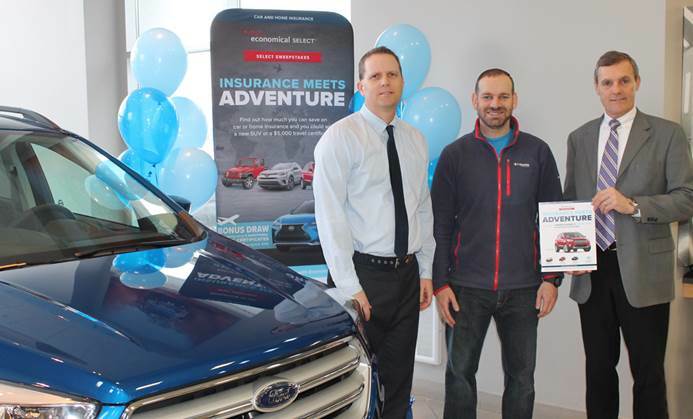 Andrew received his keys yesterday at Courtesy Ford Lincoln Dealership in London, Ontario. Andrew was entered into the Select Sweepstakes campaign as an employee of General Dynamics, one of several group programs offered at Robertson Hall. You could be the next winner. The final draw for the Select Sweepstakes campaign will take place on April 6, 2018 and includes a Lexus SUV, two $5,000 travel vouchers, and three BONUS $10,000 travel vouchers awarded regionally. All you have to do to enter is call your group’s broker for a quote with Economical Select! About Robertson Hall Insurance Inc.
Robertson Hall Insurance Inc. is a family owned and operated insurance broker and is an amalgamation of five independent insurance brokerage firms including Nelles, Robertson Eade Insurance Ltd. and Hall Insurance Brokers Limited. Robertson Hall Insurance is full service insurance brokerage dealing in personal and commercial lines and providing a full range of insurance products to London and Southwestern Ontario for over 100 years. With over 30 employees and 10,000 clients, Robertson Hall Insurance is the largest insurance provider for evangelical Christian denominations in Canada and is one of the leading insurance brokers providing group home and auto insurance in Ontario. Robertson Hall has earned a reputation from clients, as well as many major insurance companies, for being a knowledgeable and professional firm to deal with. Their goal is to provide clients with added value through professional advice and superior service. In addition, Robertson Financial Group provides expertise in financial planning, life and health insurance, investment products, and business and employee benefit programs.